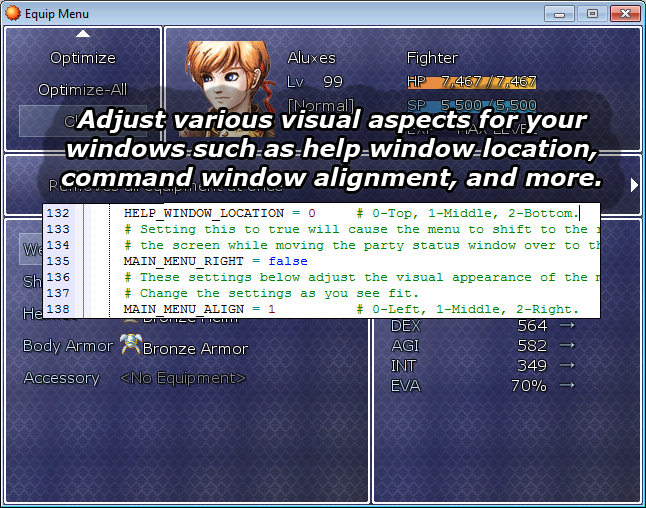 With this script, you can add, remove, and rearrange menu commands as you see fit. 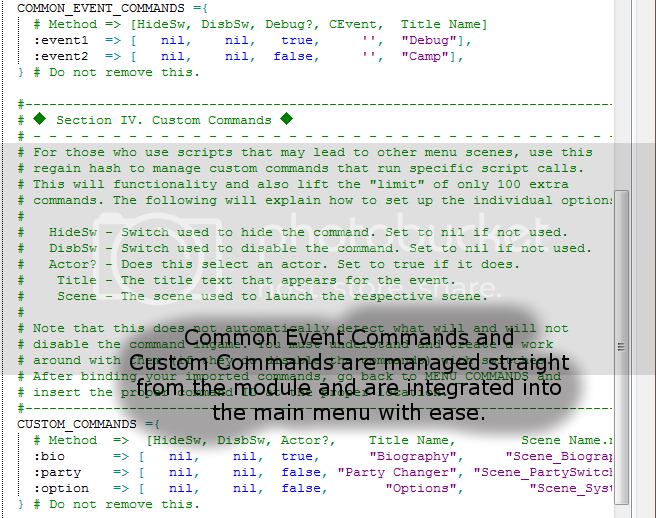 In addition to that, you can add in menu commands that lead to common events or even custom commands provided through other scripts. 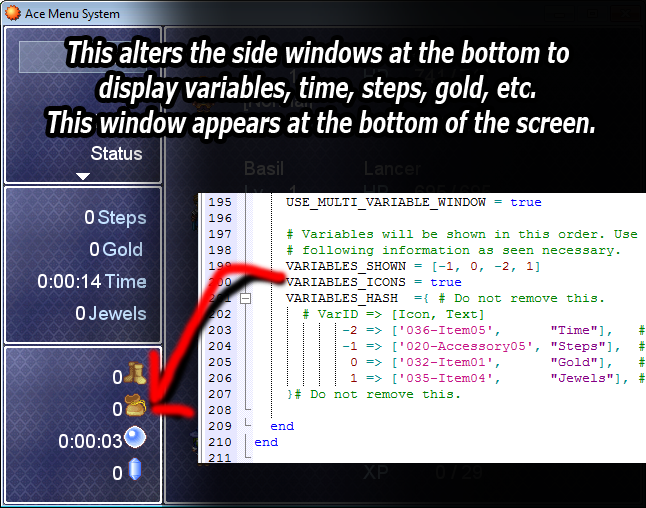 This script also provides window appearance management such as setting almost all command windows to be center aligned or changing the position of the help window. 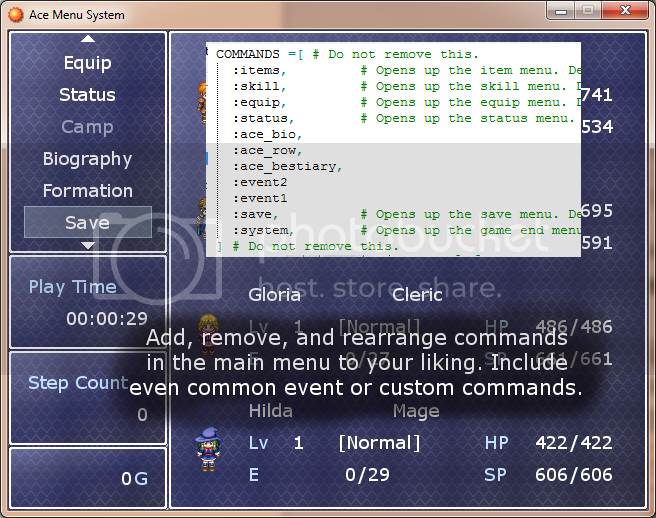 Add and removing scenes can be down easily now through the module without having to reconfigure the menu. You can now have moving battlers in the menu. To install this script, open up your script editor and copy/paste this script to an open slot below Scene_Debug, and Warrior_Engine, but above Main. Considering the special nature of this script, unless I state otherwise, it is highly recommended that you place this script above all non-core scripts. Remember to save. This is really well made! I think it looks super clean. I have a question though. I did not see anything about Key Items, does the menu account for them? Thanks, but I don't understand your question. Whats this about Key Items? uh that still doesn't make sense , are you talking about the commands (ex. item, skill, equip, status, save...). Otherwise I have no clue. In old Final Fantasy games, items were listed in 2 categories. Any regular item that can be used: weapons, armor, consumables, etc. Then the second category listed items that were basically quest related, like keys or special items that you know your party has, but shouldn't show up in the regular inventory as it doesn't have any other use outside of its quest significance. Uh okay, if thats the case then NO. This is not a item scene, it the menu scene. 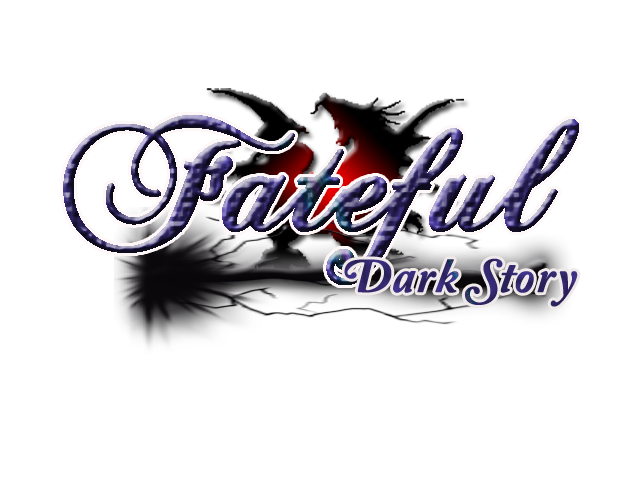 That's why I was confused, please learn to read next time this is the main menu if you want any of my other scene scripts go to my blog until I post them here. Also no, I haven't made an Item Scene yet so I can't help you there. Yeah, good job with this. Thanks you guys, hopefully I can complete the Item, Skill, save and New Game before the spring time. Because I've been moving like a snail in 2012. ● Fixed the placement of the HP, SP, and EXP. ● Added an option to turn off access to any scene.